Today, we come to our close, mutual friend, Jack Daniels. 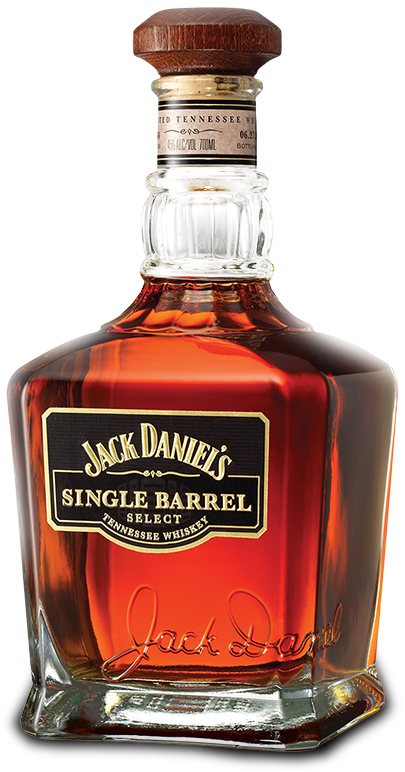 Specifically, our focus is on their premium offering, Jack Daniel’s Single Barrel Select Tennessee Whiskey. Standard Old No.7 struck us as having some potential but really ended up just sooty, sugary and a bit bland to be honest. Everything about JD Single Barrel, however, promises at least to be the remedy for those concerns. Way up on the top floors of Jack Daniel’s rack houses lie the barrels selected for today’s bottling. Only 1 out of 100 barrels actually make it into the Single Barrel Select line, but note they are still aged as long as those used for Old No.7 (four years). However, the searing and humid heat found on those top floors in Lynchburg, Tennessee (trust me, it’s hot, hoo boy!) forces so much more whisky into the oak than on the bottom floors. As temperature increases, whisky expands in the barrel, forcing itself into the charred oak and taking on a variety of flavors. As the temperature cools, the whisky contracts. This back and forth process is very much accelerated with extreme temperatures, which is where Jack Daniel’s Single Barrel finds it individuality from Old No.7. And of course, we cannot forget about the Lincoln County Process, affording even more flavor and smoothness from filtering the distillate down through the column of charred sugar maple wood. Nose – Think Old No.7, but now much more intensified. Buttery corn with wafting vanilla. Caramel, candied sweetness with peach, green banana and brown sugar. Of course, big, thick and sooty oak. Taste – Caramel and vanilla, maple syrup. Thick mouth feel with oak notes. Big, but drinkable at 47%. Finish – Banana cream pie. Medium to long finish with plenty of barrel char. Comment – No real expansion on the flavors of Old No. 7, but amplified to a considerable degree. A lumbering, bold whiskey. Certainly the preferred expression of JD for us, but the price tag is a bit up there.